I have a number of pieces of news over the next week, so I’m going to spread them out into individual posts over the next few days. The first is the most belated: at the start of the month (as noted earlier) I attended Chicon 7, the World Sf convention in Chicago. In particular, I attended the Hugo Award ceremony on the Sunday night, and was surprised and delighted when the SF Encyclopedia won the Hugo for Best Related Work. Since my fellow editors John Clute, David Langford, and Peter Nicholls couldn’t be there, I wound up accepting on behalf of the SFE team. Unfortunately (and, now, famously – it was a story on CNN at one point) the video stream of the awards was cut about fifteen minutes before our award was announced. But ustream – the company responsible – have now reposted the whole thing here. You can see the SFE’s category, and my speech, from 1.49.45. A couple of specific things to say. First, as I mentioned in my speech, the SFE is a huge collective effort, and one in which I’m very much a junior partner. I’m sure John, David, and Peter would agree that credit should be shared with everyone who’s contributed to it over the years, and especially everyone listed here. Secondly – in case it’s not clear from the video – John Scalzi did a superb job of hosting the awards, and thoroughly deserved all the plaudits he got. (See, for instance, 42.20-46.10 in the ustream video.) 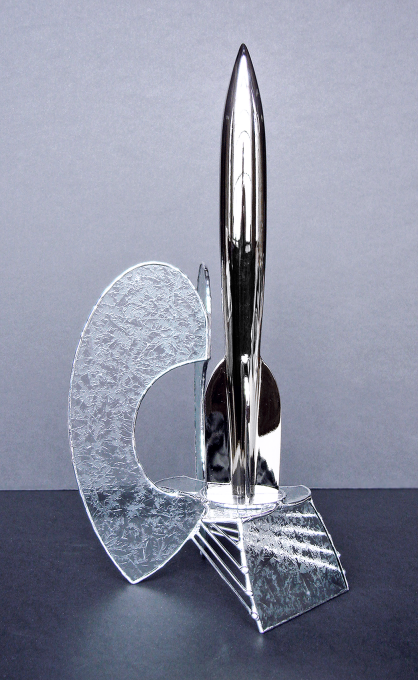 Thirdly, the Hugo base this year – designed by Deb Kosiba – is absolutely beautiful, a perfect complement for the rocket sculpture. (You can see Deb’s thoughts about the design from about 39.20 in the ustream video.) The picture opposite is not my trophy, sadly – apparently mine is still winging its way across the Atlantic. Lastly – since it’s the first occasion it’s happened to me – I thought I should record that winning a Hugo is one of those occasions when all cliches are true. It is an honour to be nominated; you don’t expect to win; the time does pass in a flash; you wake up the next morning and don’t quite believe it. Richard Man’s photographs of the event can be found here; he even achieved the near impossible and got a picture of me that I’m happy with. ~ by grahamsleight on September 29, 2012.